Since his birth in 1999, Warrior has become arguably the most famous of Australian alpaca sires, with 840 registered offspring to his credit! 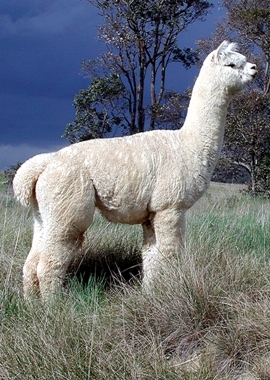 Unlike his contemporary, Jolimont Attitude (now in Europe), Warrior has remained in Australia, where his input into quality alpacas cannot be overstated. Warrior had an impressive show career, and the succeeding generations have been just as impressive. Warrior exhibits the total package = density, crimp, lustre, and conformation.